Do you want to be at risk of rowing injury this season? With school starting back up, so is the return of the competitive rowing season this term. This means more time in the boat and more training hours. Rowing is an incredible sport that requires strength, power, core strength, balance and cardiovascular fitness. It is one of the highest energy demand sports there is. As with any sport, rowing is not without its injury risks. In rowing, overuse injuries are most common due to the repetitive nature of the sport and long hours spent training. What are the risk factors for rowing injury? 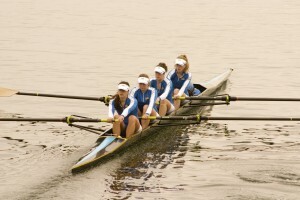 Many injuries in rowing are due to deficiencies in mobility, strength and technique and overtraining. Rowing is a sport that requires the athlete to get into challenging positions and then produce power over and over. Mobility prior to getting in the boat is an often overlooked element of preparation. To achieve the correct positioning at the catch, the athlete needs to have flexibility of the hamstrings, glutes and hip flexors to allow the hips to compress with a straight lumbar spine (low back). When this range is not available the athlete is likely to reach further with the arms rounding the lower back. This puts the structures in the spine under great load and at risk of rowing injury. Large increases in rowing volume and intensity can increase the risk of injury due to the repetitive nature of the sport. Monitoring changes in load can help highlight when you might need to have a lighter week, increase your recovery or seek treatment. How do I reduce the risk for a rowing injury? To achieve changes in muscle length, stretches need to be held for 1-2 minutes for each muscle group. Completing stretches after a rowing session when the body is warm is an ideal time to add them into your routine. Alternative: Door way stretch- lie with one leg through a door way with the other leg lengthened up the wall. Try to move your hips as close to the door way as possible. Place outside of one foot onto opposite knee. Bend opposite knee and pull that thigh in towards chest. Ensuring you have the appropriate strength and control around your shoulder to reach a strong catch position as well as being able to activate through your legs properly for the drive will enable you to be efficient in the boat and reduce your risk of injury. At Sportsfit we have Rowing Australia trained physiotherapists that can provide you with a Rowing Specific Assessment and provide you with a tailored program for your needs. If you experience an injury or pain in the boat, it is important to identify it early and get treatment to minimise time lost on the water. Rowing Australia has produced two useful resources – one for a comprehensive rowing warm up and the second a stretching guide.